The secondary bond market yields decreased marginally yesterday, on the back of average volumes, consisting mainly of the liquid maturities of 01.03.21 and 15.07.23, with their yields hitting intraday lows of 9.55% and 9.91% against the previous day’s closing levels of 9.55/60 and 9.95/00. Furthermore, the 15.10.18, 15.01.19, 15.12.20 and 01.05.21 maturities were seen changing hands at levels of 8.07% to 8.10%, 8.60%, 9.42% and 9.57% respectively. In the secondary bill market, March 2019 maturities were traded at levels of 8.73% to 8.80%. Today’s Treasury bill auction will have on offer an total amount of Rs. 12.5 billion, consisting of Rs. 5 billion of the 91 day and Rs. 7.5 billion of the 364 day maturities. 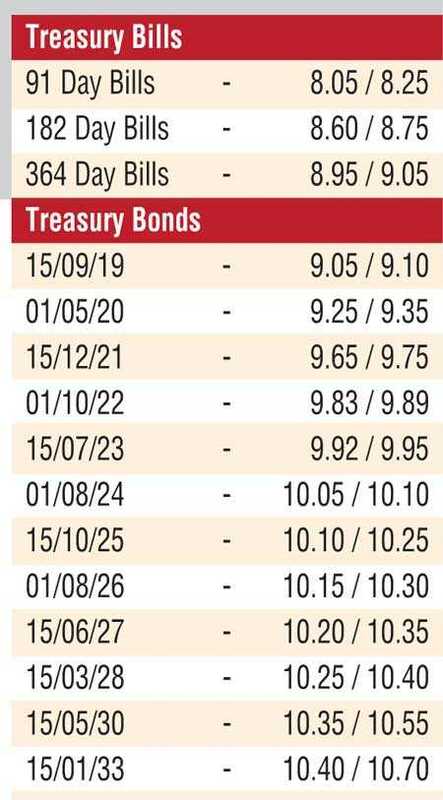 At last week’s auction, the 91 day and 182 day bills decreased by one and two basis points respectively to 8.09% and 8.60% while the weighted average yield of the 364 day remained steady at 9.00%. The total secondary market Treasury bond/bill transacted volumes for 27 August 2018 was Rs. 4.6 billion. In money markets, the overnight call money and repo rates remained mostly unchanged to average 7.79% and 7.68% respectively as the OMO Department of the Central Bank of Sri Lanka drained out an amount of Rs. 3.57 billion at a weighted average of 7.79%, by way of a two-day repo auction. The net surplus in the system decreased to Rs. 6.59 billion. The downward trend of the rupee continued yesterday as well with the USD/LKR rate on spot contracts closing the day at Rs. 161.25/35 against the previous day’s closing levels of Rs. 161.05/15. The total USD/LKR traded volume for 27 August 2018 was $ 50.50 million. Some of the forward USD/LKR rates that prevailed in the market were one month - 162.00/20; three months - 163.60/80 and six months - 166.05/25.